Rodney Goodship is living the dream. 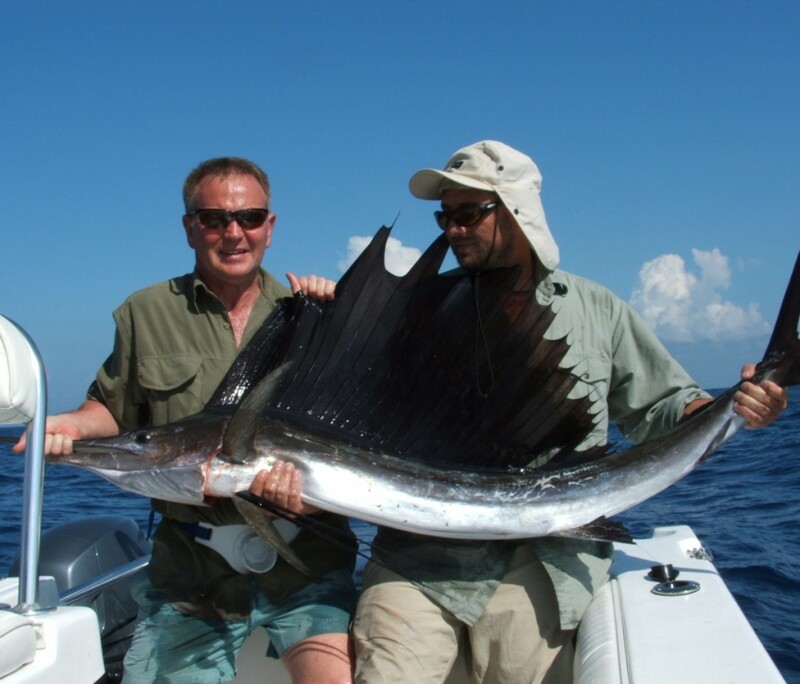 He runs fishing holiday tours in the Florida Keys where he has guided most of the big names in Fishing. 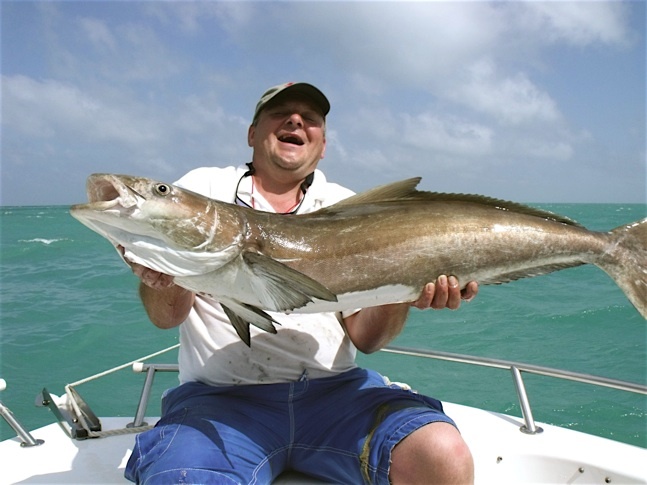 The list of species in mouth watering from tarpon and many species of shark, the truly massive goliath grouper and sailfish, bonefish and just to many to mention. 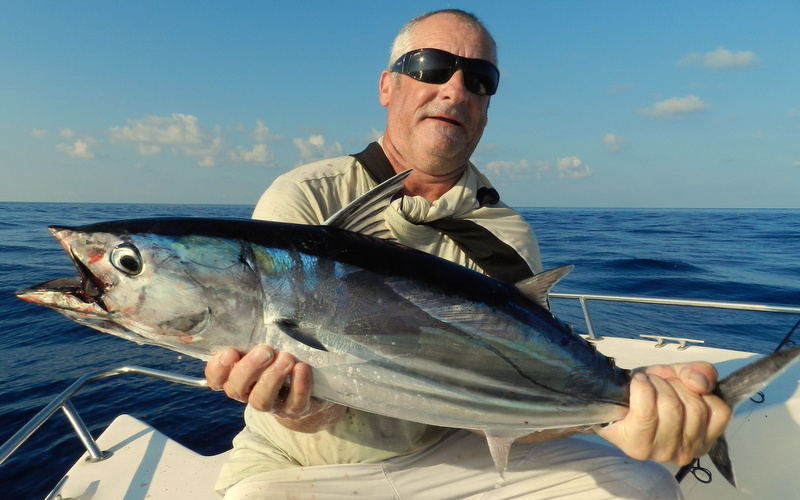 A true gentleman angler, Rodney is an outstanding guide and really enjoys nowadays putting people on their dream fish. So over to Rodney now to tell us more. Me: Welcome Rodney, can you tell us how fishing began for you? RG: I was in primary school, first class and my friend Martin asked me if i wanted to go back to his house and catch a fish we have back home called a stickleback. We had a bit of cotton, a twig and a worm and I was amazed when Martin proceeded to catch a fish! From there we joined clubs and we begged our parents to take us fishing. We soon progressed into sea fishing and would cycle twenty miles from our houses to fish at Brighton, then we got a moped and then a car and we were away! We became best friends and fishing buddies and the rest they say is history. Me: How did you first go to Florida and how did you decide on the fishing business? RG: In 98/99 we got cheap charter flights to Orlando and when we got there we checked in and went to bed as it was night time. But I couldn’t sleep so early in the morning I went for a stroll and I was shocked to see frost on the cars! We had come all this way and we had stumbled into one of the coldest periods in a long time in Florida. So we checked the weather and the only place in Florida that was still hot was the Keys, so we decided thats it lets go! We ended up staying for weeks and weeks and fell in love with the place. We kept going back and soon friends were coming out fishing with and us. We wanted to stay out longer so I said to my wife, “if you let me spend a lot of money on a boat, we could start a fishing business and bring guests out.” And that was it really…..
Me: Tell me about Fish the Dream? RG: Fish the dream is about fishing for what you wanna fish for and when and how you wanna fish. We have a meeting in the morning over breakfast before we go out and we talk about what boxes you want ticked that day and we go from there really. We are lucky here that we don’t loose any days due to weather, it’s a small island so we can always find somewhere to fish. 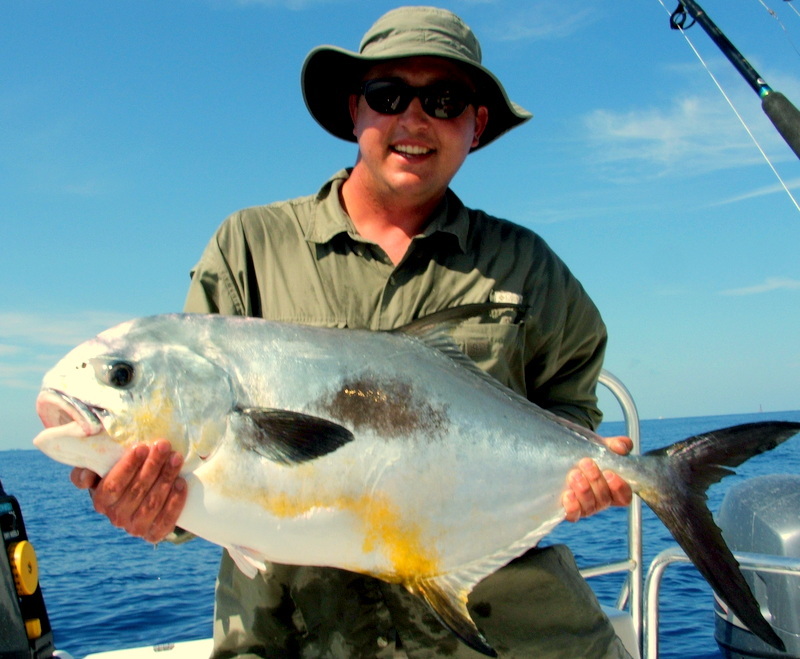 We have the Everglades, the Flats, the Bay, the reefs and we have offshore tuna grounds. I can point the boat in any direction and you will get a completely different days fishing. Up to now, we have had 124 species on the boat. Our weekly best was 55 in six days. We are doing it ten years now with 75% of our customers are repeat customers. Me: What was your personal favorite catch over the years? RG: It’s not my biggest fish, but the one I enjoyed the most was a particular day casting for bonefish. On the Flats around Marathon, there used to be some huge bonefish. I was on my own without even a camera unfortunately. Just myself one rod, one reel hooks and leader. I was twitching some live shrimp back through the turtlegrass, you’re only fishing in inches of water. Then wallop, i got one of the hardest takes i ever had, this fish shot off probably about 150 yards and gave a tremendous account of itself. When i eventually had it in it was massive. I measured it with some line, length and girth. I could hardly sleep that night and I knew I could convert it in fly fishing shop. When I showed him the line markers I had made he said it was somewhere between 13lb 7oz to 13lb 12oz. I said 13lb 7oz sounds good to me and I’ll never see one of that size again probably…. Me: Is there any Florida target you would still like to achieve after all the years? RG: One I’ve been trying for about 5 years now is daytime swordfish. They are normally caught at night from the top of the water, but during the day they go down very very deep. The closest mark to my house is 39 miles away and the best 49 miles. So it’s way out in 2000/3000 feet of water. Your using a 20lb weight just to get down which then drops off. They are one of the hardest fighting fish and I just haven’t had enough breaks to do it. Me: What is the shore fishing like in the area? RG: There is limited shore fishing as there is not much shore so to speak. You can fish the bridges in places. There is a specific area on the bridge for fishing. You can fish under the bridges in places. 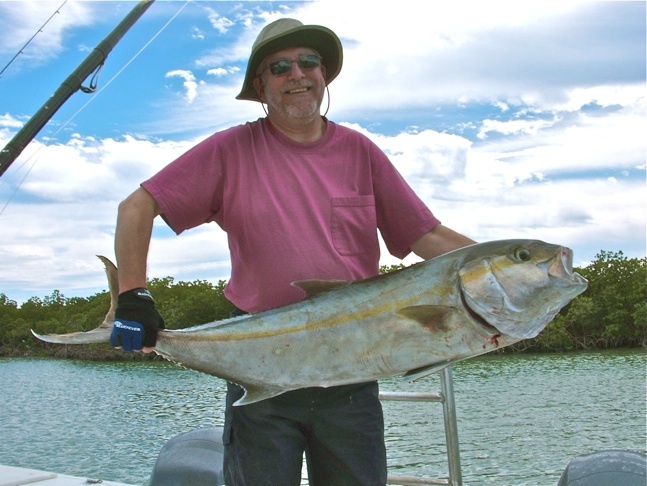 It’s perfect for lure fishing with a lot of snook, a lot of crevalle, barracuda and small tarpon. 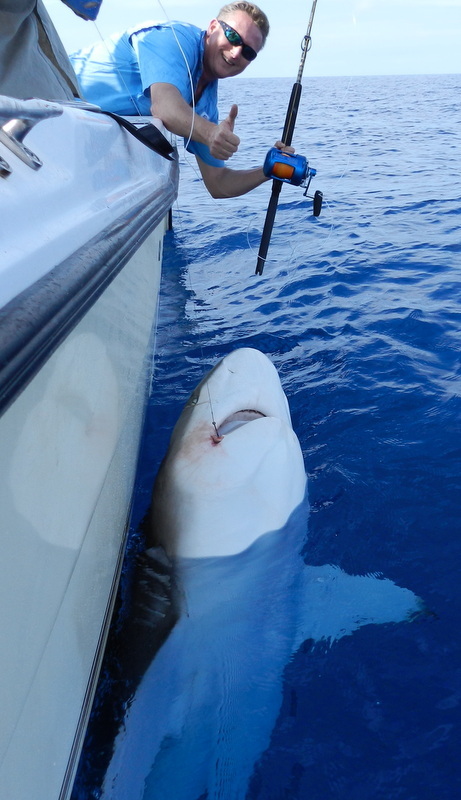 Me: You landed your first porbeagle back home recently in the UK, what was that like and what is the sharking like in the Keys? RG: I landed my first porbeagle from Whitby this year your quite right. I went out on a local boat with Rupert Drury. We went out 30 miles out of Whitby. It was spectacular. That ticked a major box for me. But here in the Keys we have had twelve species of shark aboard. 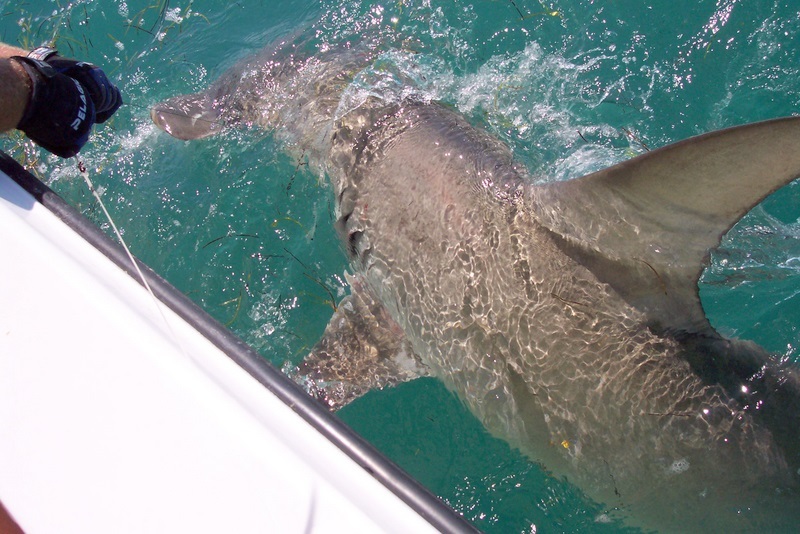 The tiger shark are stunning, we have bull shark, hammerheads the biggest of the hammerheads was a 1200lb. We also have had mako and many more species. They are all year round, night and day! Me: Whats you favorite time of the season? RG: My favorite months are December/January. 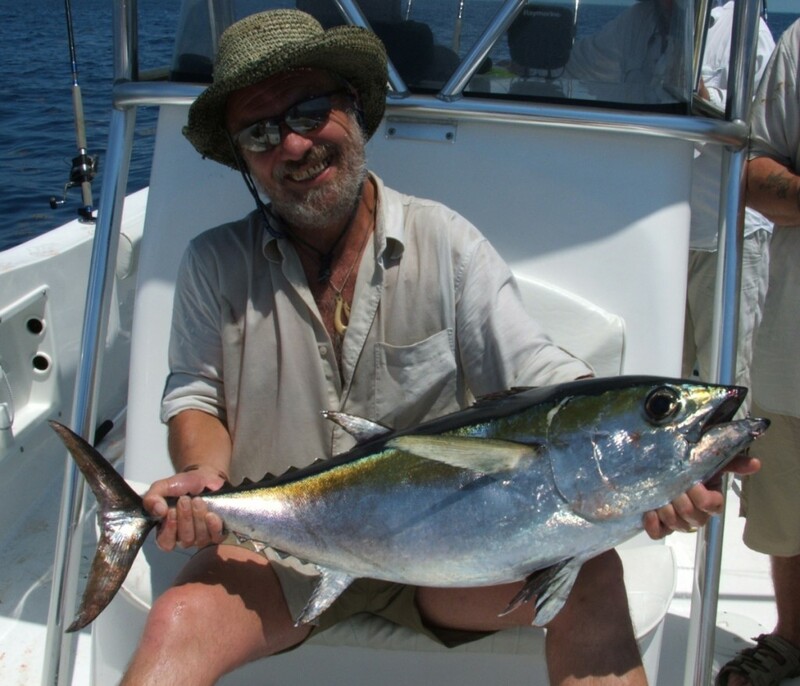 The tuna are in full swing, the sailfish are running and it’s not too hot, you can even sleep with the window open! Me: Can you tell us about the tarpon? 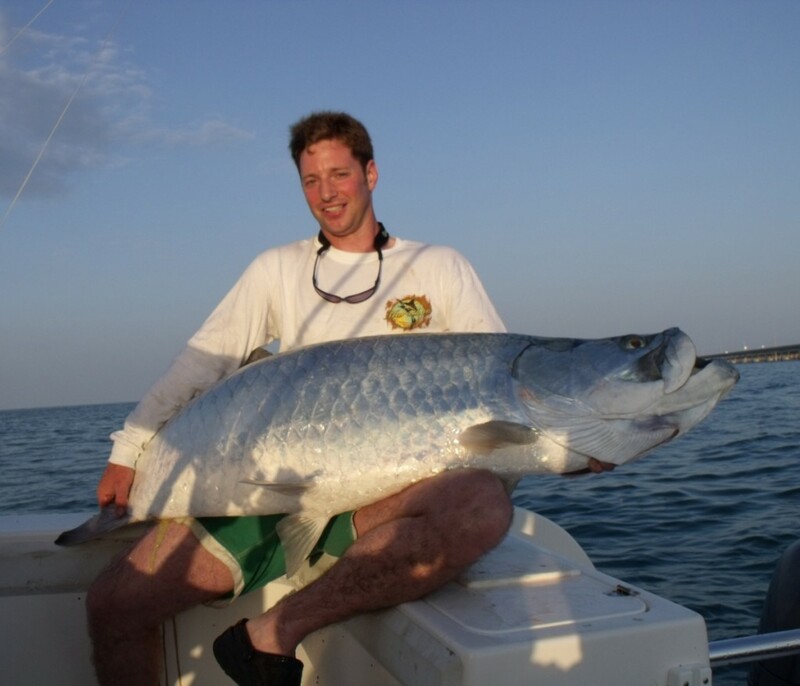 RG: The main Tarpon run is from April to June. They are a prehistoric fish and around since T-rex. 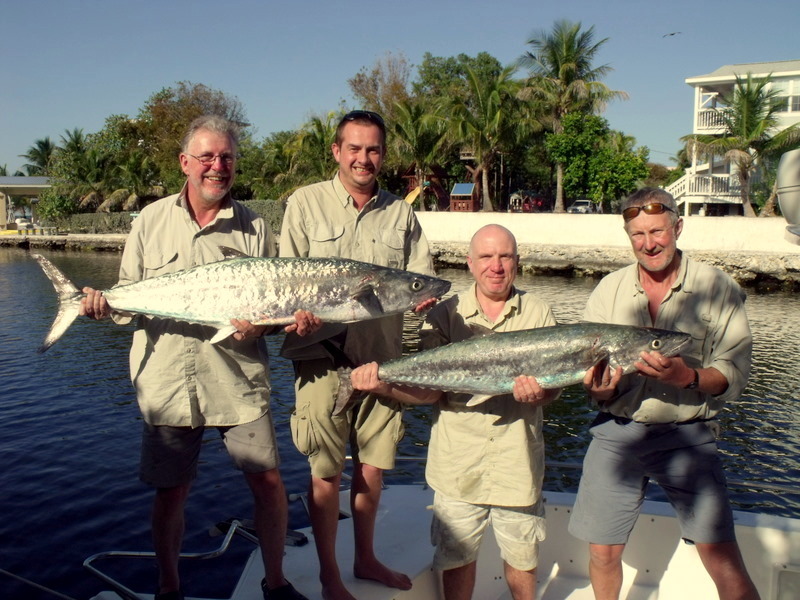 You could go out to the bridges some day and see a thousand tarpon, and get many hook ups but landing them is quite difficult as there mouths are so hard. For 4/5 hook ups you will land 1/2 fish. They cleverly spawn and migrate at the same time. 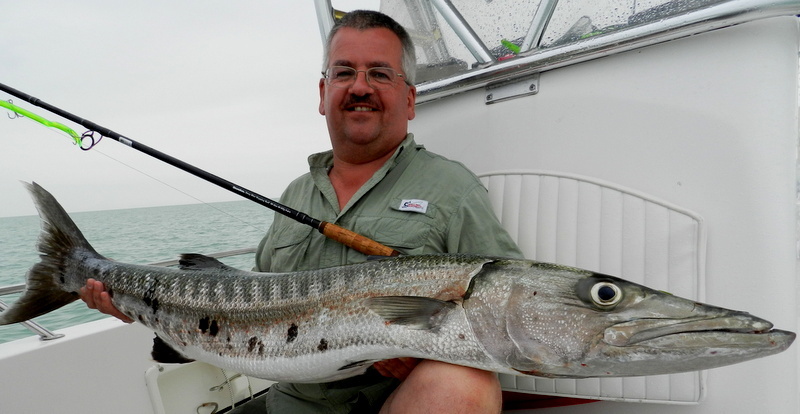 According to my records last year was the best tarpon year yet and the boats record is 209lb. Me: Whats your plans for 2014? RG: Actually I’d just like to mention my major sponsor Snowbee. We have been working together on some stunning fishing tackle. Snowbee make great stuff and if I can’t break it you won’t break it with the heavy use we give the tackle. So I’ll be busy with that so just keep watching the blog. I’ll also be looking forward to seeing more customers smiling over breakfast and just enjoying the fishing. Me: Well thanks Rodney and hopefully we will be out before the end of the year…. 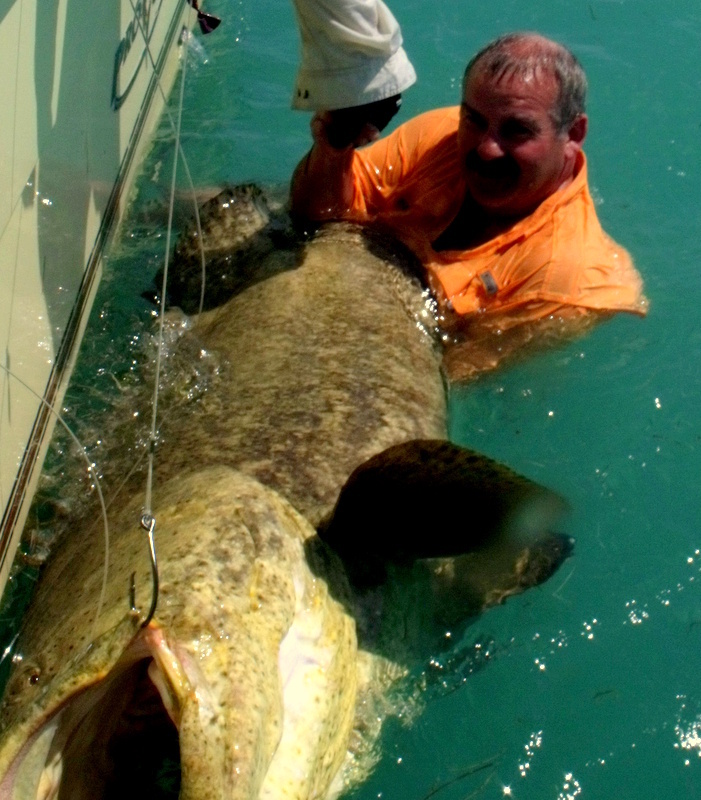 This entry was posted in Boat fishing, Interviews, Travel and tagged barracuda, bonefish, bull shark, cobia, Florida Keys, goliath grouper, hammerhead, Rodney Goodship, sailfish, snook, tarpon, tiger shark, tuna. Bookmark the permalink.